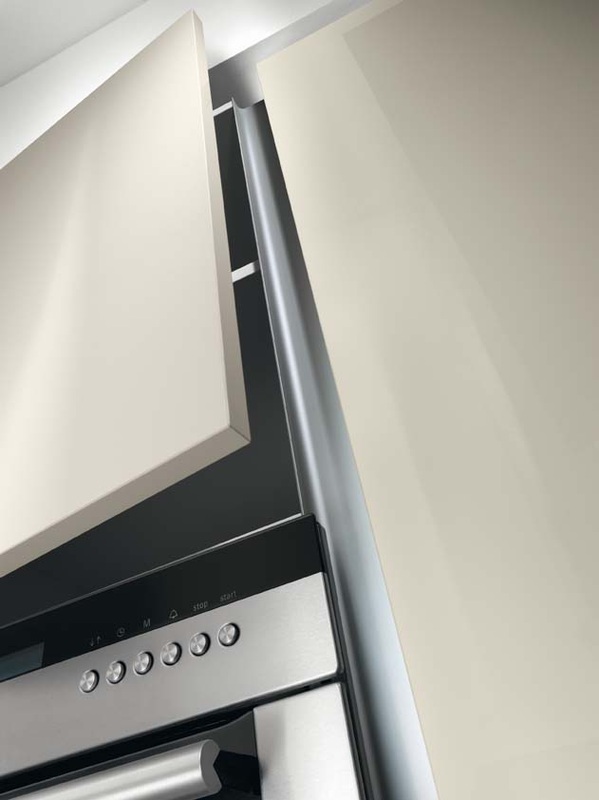 To achieve the TRUE handleless kitchen look, an aluminium rail is routed into the cabinetry. 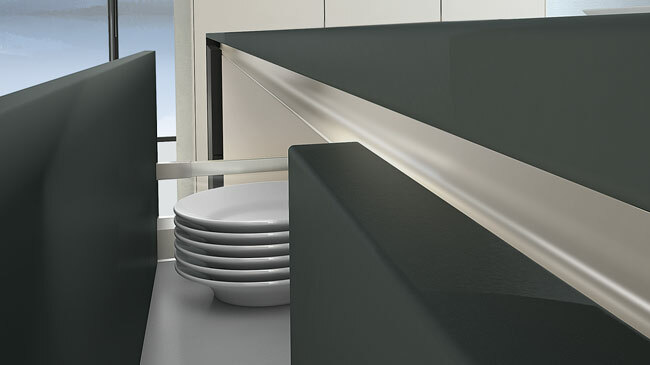 On the horizontal recess between the worktop and the door / drawer, an "L" shaped continuous aluminium rail runs along the entire run. A "C" shape section is placed between additional drawers. The "C" section allows you to open the drawer above and the drawer below whilst maintaining equal and uniform spacing throughout. On tall cabinets such as larders and appliance housing, we suggest a vertical "C" section between each of the cabinets. This works especially well on 70/30 or 50/50 split fridge freezers where horizontal a rail is unable to be fitted within the appliance (due to the appliance being in the way). By having the vertical rails, it gives everyone the optimum ergonomic design performance. Your height does not matter - the 'handle' is in the right place for every one as it runs the entire length from the floor to the top of the cabinet. A very clever design feature. We do however have the flexibility to run all handles horizontally if required. This will just require the correct appliances to be ordered to accommodate the rail. For example, a separate fridge and freezer would be required so that the rail can fit (horizontally) in-between both appliances. This design provides plenty of room for you to place your fingers "behind" the door in order to open. The recessed rail between the worktop and the door / drawer can be returned down the side of a cabinet (returning to the wall) or on the sides of an island, making the worktop appear to float. It is important to recognise that a "TRUE handleless kitchen" will always have a channel recessed within the cabinet instead of a "J" groove on top of a door. The manufacturing process is highly specialised and far more in-depth than a standard kitchen cabinet. Therefore the quality of the cabinets and attention to detail is unrivalled. "L" rail and "D rail for drawers on a handleless kitchen. We do also provide "servo drive" handleless solutions. SERVO-DRIVE – The electric motion support system by Blum is mesmerisingly easy. Lift systems and pull-outs open by themselves with a single touch and close again softly and effortlessly with BLUMOTION. SERVO-DRIVE means you need just one system for the entire kitchen. For both wall cabinets and handleless kitchen base cabinets. Users can stop pull-outs and wall cabinets in any position and set them in motion again when they want to. In the event of power failure, the fittings are still fully functional. Thanks to SERVO-DRIVE for AVENTOS, lift systems glide open at a single touch on fronts. Even large and heavy fronts open with gravity-defying ease. They lift up and out of the user's way to provide ergonomic access to interiors. Comfortable and easy closing: Provided by the easy to reach switch on the cabinet side. The product is equipped with BLUMOTION for soft and effortless closing. The cheap, awkward alternative which we DON'T supply. You will find some dishwashers and integrated fridge freezers hard to open. If you have anything but short nails.....forget it. You will be trying to grip a tiny little lip on the top edge. Try it for yourself at any cheaper DIY showroom like B&Q, Homebase, Wickes or at some lower quality independent showrooms. The trend of handleless kitchens continues to grow in demand year on year. Once deemed a niche product in the contemporary style of kitchens, handleless kitchens have now become the go to style. We specalise in this style of kitchen, offering an unrivalled choice of door ranges, colours and material. These include, laminated wood, wood veneer, acrylic and glass doors in any RAL colour. Our designers have a wealth of knowledge and experience designing handleless kitchens. We have limitless design choices as you will see from our recent projects and door style pages. This high end product will cater for clients who appreciate subtle design detail so associated with Germanic handleless kitchens. Cabinet prices tend to vary depending on design and style but will typically start from £6000, with an average cost around £12,000 for a 6m kitchen with an island configuration. Why have handleless kitchens become so popular? Handleless kitchens have been around for quite some time. There was a big trend in the late 60’s to late 70’s where a metal profile was placed on the top of the door. Since then, design has evolved a great deal. Instead of a rail on top of a door, engineers have now integrated the rail within the cabinet, creating a far sleeker and streamlined design. 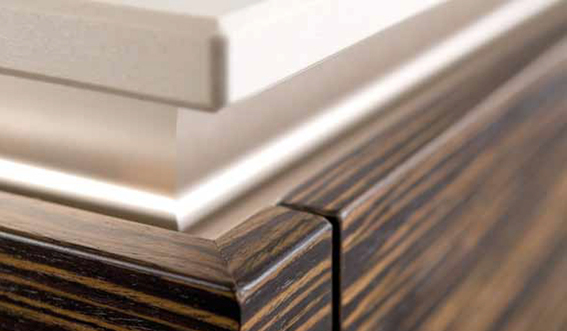 The rail now is featured as an intricate design feature instead of just a means to open a door. The colour of the rail can be anything from a brushed aluminium as our standard feature to any RAL colour. This can be matched to a bright burnt orange glass splashback if desired or even matched to a contrasting wood veneer, the choices are endless. Often, the choice of handle could change the look of the kitchen completely. Different sizes of handles depending on the size of door etc. With the German handleless kitchen the kitchen is generally more uniformed, cleaner, sleeker and pleasing to the eye. This also makes it easier to create detail in design within the door configurations instead of worrying where to place the handle. This creates far greater design flexibility when planing your kitchen. 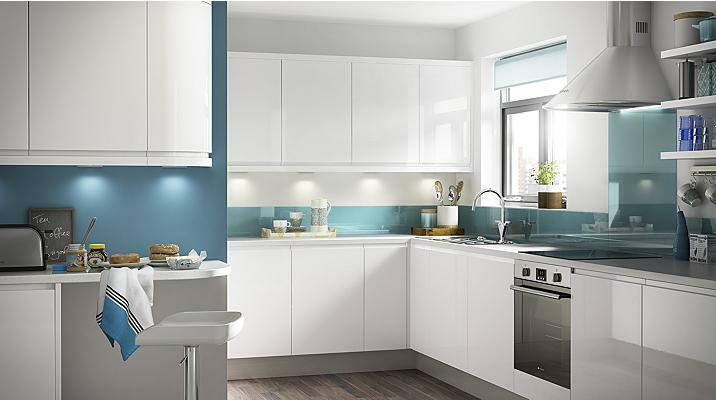 Whether we are creating a bold statement in choice of cabinetry colour or feature splashback or if you are looking for a neutral subtle scheme, the range of products available can create exactly the look and feel you require. The handleless kitchen’s clean and contemporary appearance is what most people are drawn to, but a handleless kitchen has many unseen benefits too. They take up less room than a handled kitchen. Corners can be tighter together as you do not need to make allowances for handles. The worktop can be flush with the door face. Normally on a handed kitchen the worktop would overhang the door by 20-40mm in order to be able to wipe items off the worktop onto the palm of your hand. With the recessed rail integrated within the cabinet, this creates a natural space to place your hand and therefore no need to have the worktop overhanging. Additional LED lighting can also be routed into the underside of the worktop, illuminating the handleless rail creating beautiful ambient background light. Cleaning of the kitchen is also more practical. Far easier to leave the doors streak free without the need to clean around the handles. The integrated rail is easy to clean as well. Just one wipe along the up to 4m rail. This also makes this style of kitchen more hygienic as dirt can’t accumulate in those hard to clean areas around the handles. No more catching yourself or your clothes on the handles which often have sharp edges, especially the more contemporary style. Our handleless kitchen channels are also available for vertical applications. This is something mainly German kitchen manufacturers specialise in. What does this mean for a kitchen design? Vertical "C" channels mean you can have an integrated fridge or freezers, side opening tall larders for example with one solid door. It also allows you to install a single fridge/freezer into the one cabinet. This also has practical benefits. As the handle runs vertically all the way along the cabinet, the ergonomic benefit to you is that the position you open the door is always at the right position for you. Vertical rails are available in the entire handleless range providing a complete and consistent look throughout the kitchen. This example shows a gloss white handleless kitchen with a wenge wood handleless island. However, we are also able to run the "C" channel horizontally if you prefer. Whether it's stay lifts, doors, drawers, or pull-outs: Handle-less furniture can be used throughout the home thanks to the TIP-ON mechanical opening system. TIP-ON cannot be combined with soft-close BLUMOTION. To close, simply press shut. The TIP-ON mechanism is durable and will not be damaged even if users pull open doors, wall cabinets and pull-outs. This style is popular if you do not want to see any handle rail at all. However you do lose the soft close action of the drawers and doors as you need to push the door close in order to set the mechanism to open the next time you wish to use it. Dishwashers, fridges and freezers will require a handle as the mechanism is not designed to work with these appliances. Applications for this style is generally just on wall cabinets or audio visual cabinetry. High gloss acrylic handleless kitchen doors have a lovely light reflecting quality that produces a polished and flat reflective finish. Because we use the incredibly tough acrylic veneer instead of the weaker polished lacquer which are susceptible to chipping. We are able to produce doors which have a cleaner and flatter mirror like reflection. Lacquered doors often have a "wobble" or an "orange peal" ripple in the reflection. Whether gloss or matt, approximately 50% of all kitchens designed and sold by TRUE handleless kitchens are white. The beauty of having a white kitchen is that it emphasises the clean lines which are synonymous with this style of kitchen. White also allows the maximum amount of light to be reflected around the room. Used as just a background colour, white gives you the flexibility of introducing other colours or materials into the room. We often add a wood element as the accent colour in either the flooring or cladding of the cabinets. With white handleless kitchens showing no sign of slowing down in popularity, and with white characterising a timeless kitchen colour that won’t date, it makes complete sense that you may want to consider this option. Many of our developer clients opt for a white kitchen and dress the room with bright accent colours. This allows the client to see how the look and feel of the kitchen can be altered to their desired taste without having to go through the expense of replacing the kitchen. 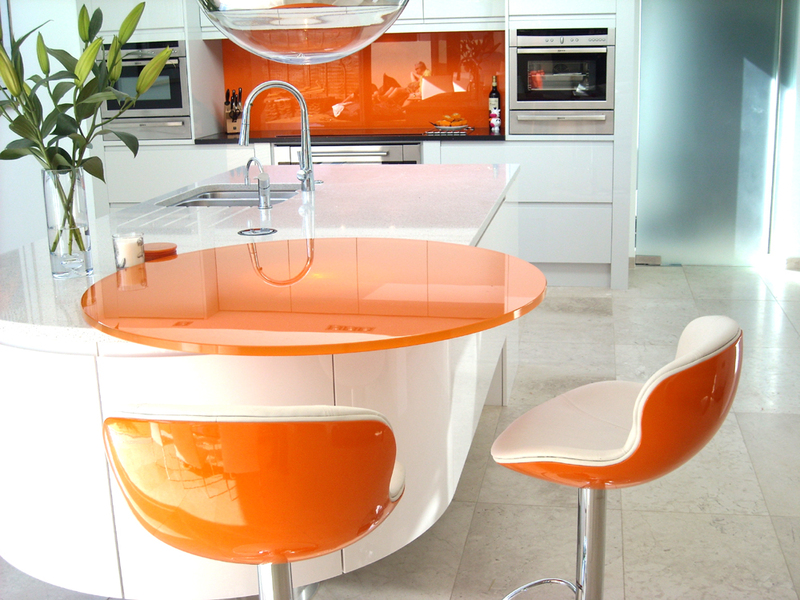 A coloured splashback with matching chairs for instance is a popular choice. No matter how large or compact your kitchen is, TRUE handleless kitchens will have a white solution for you. The look of the matt white handleless kitchen can be described as purity at its best; minimal, stylish and impressive. Matt kitchen doors produce a completely different effect from gloss doors as the surface doesn't reflect other elements throughout the room but still manages to reflect light around the room. A variation on matt kitchens is the glass suede finish, which as its name suggests is soft and velvety to the touch. However, rather than absorb light as a matt kitchen would, the satin lacquer kitchen surface reflects light although does so without creating any reflection. With this quality the satin lacquer white handleless kitchens offers the purest possible look for a kitchen, creating an appearance that is understated, sleek and contemporary. This glass option is available in any colour as it is totally bespoke. This includes any variation of white from a cool crisp polar white to the softer tones of a slightly warmer white with a slight hint of grey or ivory. At TRUE handleless kitchens we have loads of kitchen remodelling tips. We look at your lifestyle and how you and your family use the kitchen currently. Does foot traffic flow through the space efficiently? Do you want your kitchen to be a separate room just for cooking or are you after an open plan area for gatherings? Will your kitchen be a show piece for your home? The most common kitchen layouts are L shaped, U shaped, galley, island and even a G shaped. When thinking about your kitchen consider whether you want separate areas for preparation, cleaning/washing, cooking, making tea/coffee and eating. These days with open plan living a kitchen can be a classroom. Whatever kitchen design layout you choose don't under estimate how much storage you'll need. Maybe your current kitchen needs some structural changes. How about removing a wall and creating a kitchen island. An island can perform double duty as a counter top above with storage underneath. We can help you with the design and construction of a major remodel like this. Once the kitchen layout has been thought about, then you'll need to think about style. We can design a kitchen in any style. A kitchen layout will affect its functionality, though the choice of layout may be constrained by the size of your room. Traditionally a kitchen layout has been thought in terms of a triangle, with the 'points' being the sink, the oven/hotplate and the fridge as they were considered the most frequented areas. Along with this traditional thinking there was a special formula about the acceptable number of footsteps between each triangle point. Well, we think that's all old hat. The triangle idea was developed back when kitchens were stand alone rooms with only one person cooking in them. Open plan living has had an influence on kitchen design. These days there's also the dishwasher and the walk in pantry to think of. Not to mention the island bench were you may be entertaining guests, supervising homework and cooking at the same time. Plus you may have your oven (or ovens) in different places to that of your hob. The most common kitchen layouts are L shaped, U shaped, galley and even a G shaped. When considering your own triangle / pentagon / hexagon consider whether you'll need separate areas for preparation, cleaning/washing, cooking, making tea/coffee and eating. Whatever kitchen design layout you choose don't under estimate how much storage you'll need. Hard to access areas are still worth turning into storage, especially for items you use sporadically - like an ice crusher that gets used only in summer. You'll also need to consider style and appearance. Are you a hide appliances away person or do like your bright red KitchenAid or your Gaggia espresso machine on display. Then consider how much bench area you have leftover for preparation. An island can perform double duty as a bench top above with storage underneath. But an island could also restrict the flow of traffic through the kitchen. The wrong placement can turn your island into a hindrance rather than a help. Another thing to consider when you design a kitchen plan is light. Do you have a window? Does it allow direct sunlight or is it south facing? Light will affect your choice of bench top and cabinet colours. Dark surfaces in dark rooms will need more direct task lighting. We could go on with loads of other things you need to consider. Whether your designing a layout for a home or a commercial kitchen, TRUE handleless kitchens are experts. Come into our showroom as there's nothing like standing in a full size kitchen to give you some inspiration. Bring in your wish list, your mood boards and your magazine clippings and we can help you bring your kitchen dream to life. Where do you go for kitchen design ideas? Homemaker magazines, internet sites like Pinterest with a thousand and one boards named 'Dream Kitchen', weighty architectural coffee table books, and the ever present home renovation shows. Well they're all great sources for kitchen design ideas. We think the more research you can do the better. Nowadays practically anyone can be kitchen designer. At TRUE handleless kitchens we actually think that's a good thing. The average homeowner has become a lot braver with their colour choices and more confident in their decision making just because they've seen other people 'doing it on the tele'. But then of course you need to find a company who can interpret your vision and actually build your kitchen to the highest possible standard. Whether you're building from scratch, remodelling an existing kitchen, expanding a small kitchen, creating an island bench or just want some clever storage ideas, the team at TRUE handleless kitchens can work with your kitchen ideas and create a kitchen that is right for you and your budget. 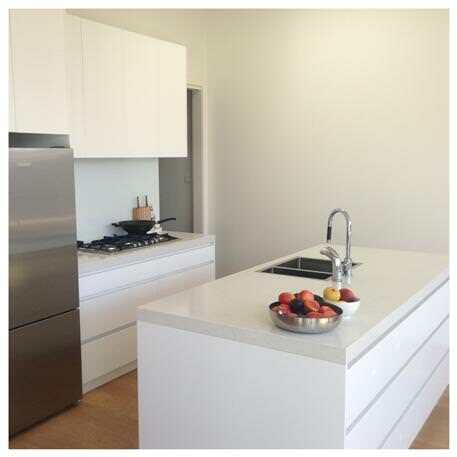 - Benchtop material, solid surfaces, such as Caesarstone or investing in marble or granite. - Glass splashbacks in your choice of colour, mirrored splashbacks or tiles, such as the ever popular subway tile. Choosing white or off white cabinetry allows you to add colour in accessories, which can be changed from season to season. Take a good look around our website for lots of kitchen and design ideas. Our recent projects page shows a selection of some of the projects we are most proud of. 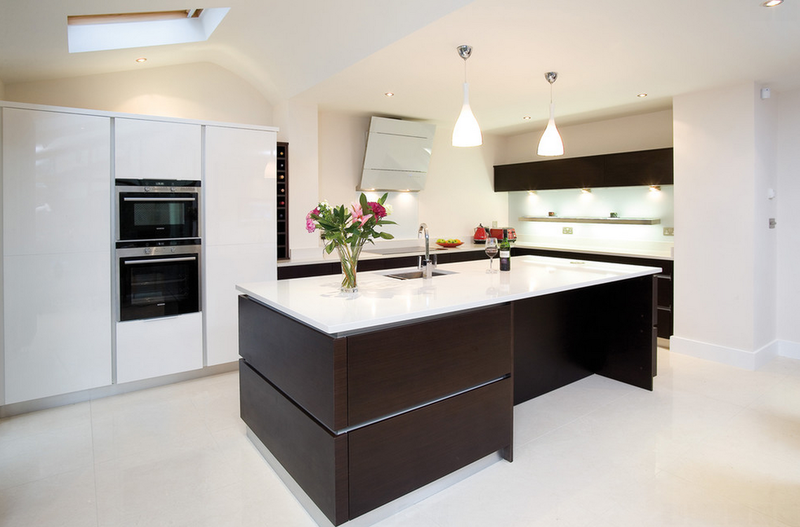 At TRUE handleless kitchens we know & understand kitchens, with 60 years combined experience. Our sustained recipe for success is a combination of design flair, quality craftsmanship and a reputation for peerless customer service. Our designers, cabinet makers and tradespeople have all worked in harmony for many years and the list of hundreds of satisfied customers is growing and growing. We know our methodology gets fantastic results for our clients. And above all we believe a job is only finished once our clients are 100% happy. You want kitchen ideas? We got kitchen ideas! So take a good look around our site for loads of inspiration and ideas. Our Gallery showcases some of our best work. The kitchen is most often the focal point of the house. We cook, we entertain, we socialise in it. With so much time spent here, it makes sense to put a little extra into planning a functional kitchen, to make sure everything is exactly how you want it. Choose an experienced and reliable kitchen designer in your area. Make sure you discuss with them what you'd like, but also what recommendations they might have. You never know what new product is on the market that could be perfect for your needs. Check their qualifications; ask to see previous projects and talk about your budget. It's also a good idea to ask for references and visit the showroom if possible to check the quality of work. When working through the design, make sure you use the space well. You should try to be as efficient and functional with storage as possible. Lots of storage and lots of work space is the key to most functional kitchens. Your designer should assist you with this. Think about how you want to use the space? Do you want to walk through the kitchen as a thoroughfare, gather in it, eat in it, entertain in it? This can influence its layout. Don’t attempt a do-it-yourself kitchen renovation. Leave it to the experts! Kitchen designers will recommend appropriate materials and can make a functional and cost-efficient kitchen that reflects your taste, style and personality without hassle. Be practical and determine what you really want for your modern kitchen design. Be sure to list all your necessities. Don’t select poor kitchen lighting – this is also one of the most important features in your kitchen design. Consider using 3 types of lighting: (1) general lighting for overall illumination, (2) task lighting - over your work spaces and (3) accent lighting. Weigh up the work areas in your kitchen and what you’ll be using them for; this way you can forecast for which type of lighting should go where. Plan out step by step what needs to be done and how you plan on getting there, when you want to start the project and finish and also add a little extra time and money to eliminate surprises. This can help avoid mistakes and lost time. A kitchen project is exciting, but it can also be stressful. It takes a whole lot of planning and patience. Make sure everything is discussed with your designer from the start to ensure a fantastic success. The kitchen is now often used more than just for cooking and preparing meals – it can be a place to entertain guests, check on the kids homework or a home office. The secret to accommodating for all of these tasks and more, essentially comes down to kitchen design and flexibility. Having a kitchen that is efficient, accessible and functional will go a long way in assisting the lifestyle you lead. Thinking about a new kitchen design can be exciting and daunting. Instead, you can always ask our advice from our experienced kitchen designers, they will guide you every step of the way. Visit some kitchen showrooms to gain ideas and designs you would like to incorporate in your home. Discuss the basics of how you want your kitchen to look. Consider the relationship between the sink, stove and refrigerator. The ideal layout creates a working triangle- allowing equal access to each. Yet depending on the layout of your kitchen the working triangle might not work for you. Instead, consider zones such as refrigeration and food storage, food preparation, cooking, and wash zone. Be create in gaining more space in your kitchen. If you have a small kitchen space, try hanging anything—from cups to strainers to frying pans. Another space-saving tip is extending overhead cupboards to the ceiling. It gives the illusion of space and height and creates additional storage up high- light-coloured cabinets are best. Recessed lighting, glossy finishes & mirrored splashbacks also help with the illusion. Bring along a floor plan including detailed measurements, if possible. Gather images from magazines or online websites of designs you like, this will assist the designer to get a feel for what you're after. Make a wishlist of your appliances (new or existing) plus new kitchen materials such as bench tops, splashbacks, handles, flooring & lighting. Use our guide to help you estimate a realistic budget and a timeline for your renovation for discussion with designer. Consider putting your own personality into overall kitchen design by mixing vibrant colours or finishes of your choice. Also, consider the colours of your appliances. If your appliances are stainless steel or white, take them into account when choosing your cabinet colours. We know that kitchen renovation can seem a bit overwhelming at times, but the more time spent determining what you really want; the better the finished project will reflect be, your personal style and meeting all your needs. When you think about kitchen renovations, some think of modern sleek designs with glossy finishes, others think of mouldings and detail that go along with a country style or French provincial feel. What ever your taste, if your updating your kitchen, chances are it will become the centre piece of the home. In addition to updating the aesthetics, a new kitchen can add value and interest. Depending on your lifestyle and personal taste, you could also include surround sound stereo, a bookshelf, a kitchen office or a modern gas-electric fireplace to make wintertime meals more enjoyable. When thinking about your kitchen layout, make sure you visualize the entire space along with how you'll use it every day. If you need some ideas or inspiration come in and visit our kitchen showrooms or consult with kitchen designers– from advanced equipment to sleek benchtops and cabinets as well as a touch of lighting, lots of styles and features are on display for your assistance. 1. Work triangle – You can create a kitchen plan which consists of “work triangle” (sink, cooktop and refrigerator). As a general kitchen rule, work triangle must be 7900mm or less with no length shorter than 1200mm or longer than 2700mm. 2. Bench tops – For the bench tops, it is important to choose a look that compliments your kitchen floor, cabinets as well as the paint job on your kitchen walls. This makes a stronger statement that brings more visual interest. Combining more than one bench top material can prove t work very well too. 3. Kitchen flooring – Flooring can be easily forgotten about when designing a kitchen. You can ask your kitchen designer about the best choices for suitable flooring and materials to use such as tiles or hardwood boards. 4. Lighting fixtures – The feel of the kitchen can be significantly improved with even the smallest adjustment in lighting.Think about using pendants over island benches, recessed lighting over work spaces and general room lighting. 5. Kitchen designers - using their expertise, designers can help you add a little something extra into the design, taking it from 'wow' to 'amazing'! Aside from taking notes from magazines and the web, you should also consider your own preferences and style. Add a twist on your own kitchen that expresses your uniqueness. The design of your kitchen is important not only because it provides a place to entertain, to cook and prepare meals and to work but you also need to ensure the kitchen is spacious, efficient and functional to allow these activities to take place in conjunction. Many features can contribute to how well a kitchen functions and looks. A popular feature of contemporary kitchens today achieving a streamlined, sleek design is the handle less style kitchen. Using the most advanced push-to-open and soft close predominantly drawer systems, the feature allows for the finish of the cabinetry to stand out rather than the accessories. The handle-less kitchen creates a visually stunning minimalist look with a sleek and smooth design. You can choose from many different finishes including wood, gloss vinyl, gloss acrylic, gloss lacquer, veneer and many more. The handle-less kitchen is perfect for those who want clean and refined look - and there is no need for dusting and polishing the grime and grease that mounts up around the handles as they are easy to wipe and clean! The handleless kitchen always creates a fresh and clean look. Its minimalist effect also works very well for smaller kitchens to reduce clutter and on larger kitchens to increase the illusion of spaciousness. TRUE handleless kitchens can create a range of different layouts and designs ideal for your kitchen taste. We have everything you need for a kitchen renovation – providing excellent craftsmanship and materials with contemporary styling that suits your space and a kitchen that is designed to match your personality and lifestyle. Many of us would love a large designer kitchen, with every available new appliance and lots of bench space but the reality is we don’t always have the space available. Whether your kitchen is in a small stand alone room or the space available for your kitchen is only small, it doesn't mean you can't have a functional, efficient kitchen to work in. Our kitchen designers work hard to include storage, workable bench space, appliances that will help you cook up a storm and a finish that you’ll love. “I can’t fit anything in my old kitchen"
Questions and statements like these are asked and stated every day. In short, the answer to, ‘can someone help make my small kitchen work and feel bigger?’ is a resounding YES!! Our Designers at TRUE handleless Kitchens believe a kitchen must be first be functional and then from there we ‘dress it up’. Small kitchens are no exception. We work with you to maximise every piece of usable space, creating a kitchen design that has easily accessible storage systems. We work with you to create specific areas for preparation, cooking and cleaning up, ensuring that more than 1 person can work in the kitchen at any one time. There are many ‘visual tricks’ that can be used to make a small room feel bigger. The colours chosen for doors, benchtops, splashbacks and the placement of appliances and cabinets will help make the room bigger without compromising on the function. In a small room, you don’t want to fill the room with tall cabinetry, eg with pantries, banks of wall oven towers etc. Often an underbench oven and limiting the amount of tall cabinets can make the room feel more spacious. Clean lines throughout the handleless kitchen design are also important, where possible. An undermount sink with a separate/removable drainer can make a room feel more spacious by having less visual clutter; simplicity is important in small kitchen design. Having a removable drainer can also help create more space between a sink and cooktop. Or using clever accessories that come with sinks can help utilise the whole bench. Dishwashers and washing machines should always be integrated within a small handleless kitchen. By having a matching door over the top of the appliance the appliance just looks like a cabinet. This avoids breaking up the small space with several freestanding appliances. Glass splashbacks are typically 6mm toughened safety glass, which adheres to all UK building standards. Either clear glass is used, which has a natural green tint, which is good for strong dark colours or Starphire glass, which is a low iron glass. Starphire glass eliminates the green tint and allows for more accurate colour matching for light, warm colours. Mirrored splashbacks are being used in the kitchen more and more. State of the art, heat resistant mirror is used in different shades, silver, smokey or bronze. A mirrored splashback visually expands the space and can all light to any room and is especially effective in smaller kitchens. Mirrored Splashbacks also create a touch of style and elegance to a room, especially in an all-white kitchen. Keeping your glass splashback clean couldn't be easier. Glass cleaner and a soft cloth or paper towel is all you'll need to keep it looking stunning for years to come.